My column at eMusic this month is a brief oral history of Mission of Burma's discography (well, except for Snapshot). Not really what I think of as writing on my part, more like listening and trimming, but they've got some very interesting things to say about their records. Otherwise: I've hit the one-month mark on my deathgrip dual-throttle Dylanology, listening to all of Bob D.'s records in chronological order for an assignment (today was Infidels day). Getting increasingly fascinated by the subcultural apparatus around the guy--reading Michael Gray's book about his lyrics Song & Dance Man III is making me want to go listen to a lot more prewar blues. The other outstanding (in both senses) listening-for-work I'm doing right now is the Fall's complete radio sessions and the Naked City box--why do I end up taking on the immersion-type projects all the time? This is why I used to make a point of reviewing singles. 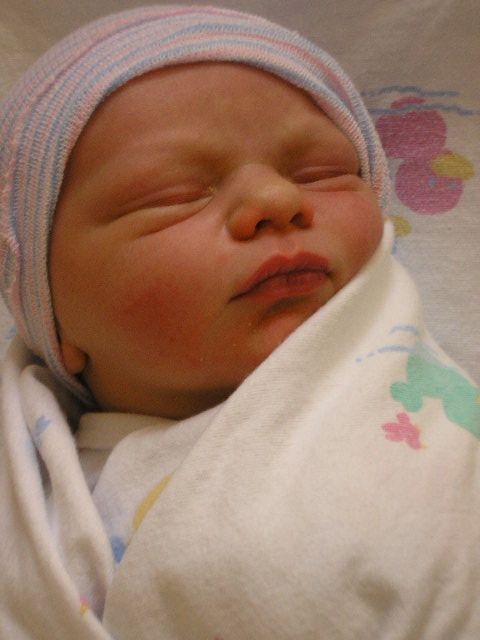 Sterling Franklin Wolk was born Monday afternoon around 4:25. 8 pounds, 9 ounces, 21 inches, currently sleeping fitfully about eight inches away from me. Mama and baby both doing great. You can't tell here, but his hair is blond and straight, with a little cowlick up top, and is also the softest thing of all time. Further baby-related extreme cuteness will generally appear on the more personal blog rather than here; as usual, email me if you want to know where to look. As I've warned before, updates everywhere will probably be sporadic for a bit. No updates, because no news: in a holding pattern right now. Not getting out of the house much (apart from a trip to see Bob Dylan play the other night, which I'm writing about elsewhere). All cultural engagement right now is in the service of three or four upcoming big pieces. Updates will be sporadic until there's news. Then updates will probably be sporadic for other reasons. Word comes from Irwin Chusid that Scrawl--a band dear enough to my heart that the column I've been writing on and off for 13 years is indirectly named after one of their albums--are looking to release a compilation of a bunch of stuff from their pre-Elektra years. They own the rights to He's Drunk, Plus, Also, Too, Smallmouth, Bloodsucker and Velvet Hammer, and there's also a Peel session, some live recordings and a few other things. And they're playing a reunion show opening for Shellac next month in Chicago. If you're reading this & are interested in talking to Scrawl about putting something out, you can contact the band via Irwin at keyofz [at-sign-goes-here] mindspring.com.